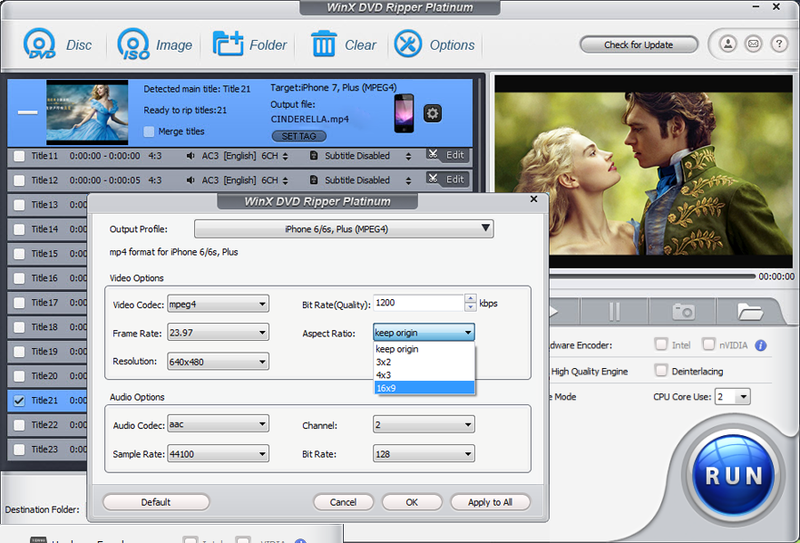 After you purchase WinX DVD Ripper Platinum it may be used indefinitely. George Butel This is the easiest-to-use DVD ripper program there is. If you just want to save the video from a dvd for later use, say as an mp4, and don't want all the oddball parts of the DVD--trailers, etc.--you'll like this because it's easy to see which "title" is which and just rip what you want. What's on a DVD comes over as a list of "titles" that may not have any obvious relationship to the parts of the movie. With this program, you can easily see what the "title" are. There's almost always extra stuff on a dvd that you really don't want to see: you just want the main movie or whatever it is. You can check the "titles" that you want to rip, and skip the non-essential ones...I have a couple of their other programs, and they work wonderfully also. I do wonder whatever happened to their winx-bd-decrypter, the blu-ray decrypter. Regarding the Blu-ray Decrypter, our developing team are doing their best to upgrade it with newest features I believe it will come back to customers in the near future. Daniel Why do you have the following in the fine print on software people are paying for? DVD Ripper in fine print says you must install within 7 days. You seem to like to sell your software with just 7 days to install and cannot after special is over. Some or most of the paid software say must install in 7 days or cannot afterwards. When people write to you about the "You must install in 7 days." you say you can install any time. The fine print says intall in 7 days. If you can install at any time on paid for software edit out "You must install in 7 days" the fine print. Change it to "You install any time Edit after you copy and pasted in fine print. I was going to buy DVD Ripper and DVD Copy Pro until I read the fine print. DVD Ripper in fine print says "You must install within 7 days." Constantin Florea @Daniel, I am sorry about the issue. The paid version has the same benefits the vendor provides on the product site: lifetime upgrades and no limit on the registration time-frame. Mike Krueger Hello, when I got my version of MacX Video Converter Pro it said I had 3 days to install and couldn't install after that. That was in 2013. Well, I recently upgraded to a new Mac and tried to reinstall and the serial number didn't work! I guess when it says you can't install after 3 days they mean it. Very unhappy! Thom Farrell I keep getting emails that is free today and every time I come to the page it is not. Naughty, naughty BitsDuJour. This false advertising is getting tiresome. KimY Hello, Anyone know if ripped media files is compatible for playback when streamed from Plex Server running of nVidia Shield TV (Android) ? Thank you. Adam P I tried registering, but the registration email only has the code. The activation screen wants an email address and a code, and when I try not using an email address or using my BDJ email address it get declined. How do we register the program? Adam P What valid email address? The BitsDuJour email just has a registration code: AA***-*****-*****-***HO. I tried registering with my bits email address bu that didn't work. Molly_Digiarty @Dirk Coleman @Doug Atkinson We're very sorry that our product dashboard had automatically adjusted back to the wrong sets. It should have sent the four products: DVD Ripper Platinum, DVD Copy Pro, VideoProc and MediaTrans. And our sales team will send you the other two products VideoProc and MediaTrans to the email address of your order ASAP. Thank you for purchasing our products and sorry for the inconvenience again! Molly_Digiarty @Adele Crocker Thank you for your interest. It enables to transfer from your old PC to another one as long as you deactivate and then reactivate with the license key and the email address you registered with.